Investors read newspapers as they monitor stock prices at a brokerage house in Beijing, Tuesday, Feb. 6, 2018. Shares tumbled in Asia on Tuesday after a wild day for U.S. markets that resulted in the biggest drop in the Dow Jones industrial average in six and a half years. U.S. stocks rallied Tuesday as a late surge helped them regain almost half their losses from the day before, when they had their biggest plunge in 6 ½ years. That came at the end of a day of heavy trading and huge swings for the market. Major indexes in Asia and Europe took steep losses and U.S. markets started sharply lower, only to repeatedly change direction. After its 1,175-point nosedive Monday, the Dow Jones industrial average lost 567 points right after trading began. After numerous turns higher and lower, it wound up with a gain, coincidentally, of 567. Despite the turbulence, Tuesday's trading looked similar to the patterns that have shaped the market for the last year: investors bought companies that do well when economic growth is strongest. Gainers included technology companies, retailers like Amazon and Home Depot, and industrial companies and banks. Bond yields turned higher after a sharp drop Monday. As a result, the biggest losses went to high-dividend companies such as utility and real estate companies, which investors often buy as an alternative to bonds. When bond yields rise, those stocks become less appealing to investors seeking income. The yield on the 10-year Treasury note rose to 2.80 percent from 2.71 percent. 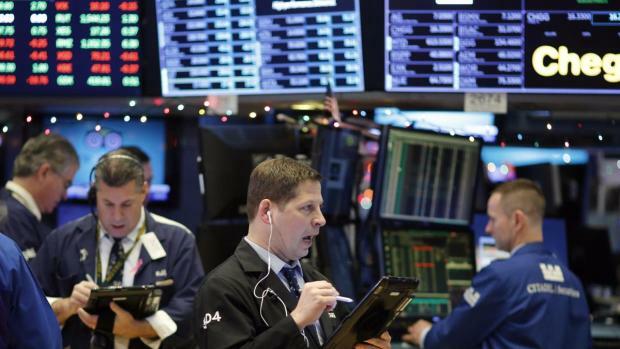 The Dow finished 567.02 points higher, or 2.3 percent, at 24,912.77. The Standard & Poor's 500 index, a broader market barometer that many index funds track, climbed 46.20 points, or 1.7 percent, to 2,695.14. The Nasdaq composite rose 148.36 points, or 2.1 percent, to 7,115.88. It was the busiest day of trading on the New York Stock Exchange since Nov. 10, 2016, two days after the presidential election. The steep drops Friday and Monday wiped out the gains the Dow and S&P 500 made since the beginning of the year, but both remain higher over the past 12 months. The Dow is up 24 percent over that time, the S&P 500 18 percent. Even after Tuesday's gain, the S&P 500 is still down 6.2 percent from the recent record high it set on January 26. That's less than the 10 percent drop that is known on Wall Street as a "correction." Corrections are seen as entirely normal during bull markets, and even helpful in curbing excessive gains and allowing new investors to buy into the market at lower prices. It has been an uncommonly long time since the last market correction, which ended almost two years ago. Brent Schutte, chief investment strategist at Northwestern Mutual Wealth Management, said the plunge wasn't caused by inflation fears alone. The markets have been unusually calm since late 2016, and he said investors were betting that would continue. "People were positioned for more central bank easing or continued central bank easing, low rates, and importantly, low volatility," he said. "Corrections are caused by people having to reposition for new environments." Investors remain fearful that signs of rising inflation and higher interest rates could bring an end to the bull market that has sent stocks to record high after record high in recent years. Friday's U.S. jobs report showed wages grew at a faster pace in January, and investors worried that that means inflation is speeding up, and that the Federal Reserve will have to raise interest rates faster than previously expected in order to keep that inflation in check. Higher rates act like a brake on the economy by slowing down borrowing and lending. Schutte, of Northwestern Mutual, added that corrections can end quickly, and they often do so when investors see evidence of continued economic growth. Experts do think the global economy will keep growing this year even though that is likely to bring more inflation. Schutte said that as central banks stop propping up the market, trading will probably be more volatile in the next few years. Travel bookings site TripAdvisor was one of only two S&P 500 companies that finished higher on Monday. On Tuesday it rallied another $5.22, or 14.7 percent, to $40.84. U.S. crude oil fell 76 cents, or 1.2 percent, to close at $63.39 a barrel in New York. Brent crude, the benchmark for international oil prices, lost 76 cents, or 1.1 percent, to $66.86 a barrel in London. Wholesale gasoline lost 4 cents to $1.81 a gallon. Heating oil dipped 3 cents to $1.99 a gallon. Natural gas added 1 cent to $2.76 per 1,000 cubic feet. Investors often buy gold when they're worried about market volatility, but they aren't doing that now. Gold fell $7, or 0.5 percent, to $1,329.50 an ounce and silver dipped 9 cents, or 0.5 percent, to $16.58 an ounce. Among the biggest losers Tuesday was Tokyo's Nikkei 225 stock average, which ended 4.7 percent lower. 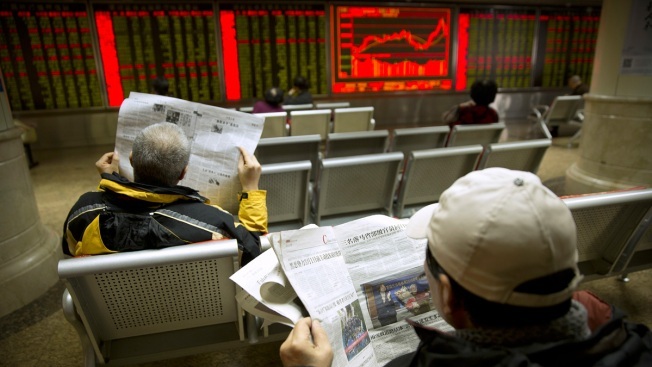 Hong Kong's Hang Seng skidded 5.1 percent and South Korea's Kospi declined 1.5 percent. In Europe, Germany's DAX fell 2.3 percent and the CAC 40 in France lost 2.3 percent. The British FTSE 100 index fell 2.6 percent. In other commodities trading, copper fell 3 cents to $3.19 a pound. The dollar fell to 109.33 yen from 109.70 yen. The euro dipped to $1.2392 from $1.2399. On Monday, the Dow finished down 4.6 percent while the S&P 500 sank 4.1 percent. The last fall of that size came in August 2011 when investors were fretting over Europe's debt crisis and the debt ceiling impasse in Washington that prompted a U.S. credit rating downgrade.